Five must-watch TED talks on stress - they'll change your views on stress! At the back of my own experience with stress and on a mission to help other mums overcome stress and overwhelm, I’ve been doing some research. And what’s everyone’s starting point when you’re looking for inspiration? Well, Google of course, but I purposely headed over to the TED channels to find out all I could about stress. 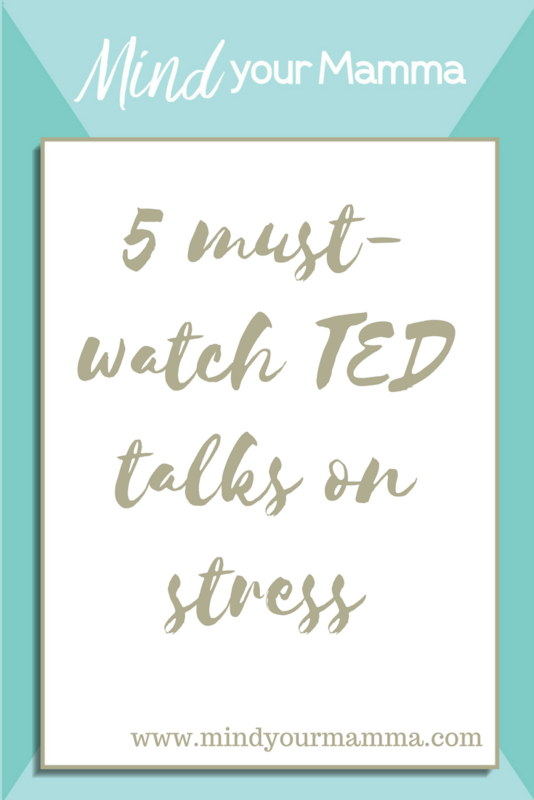 So here are my 5 must-watch TED talks on stress. 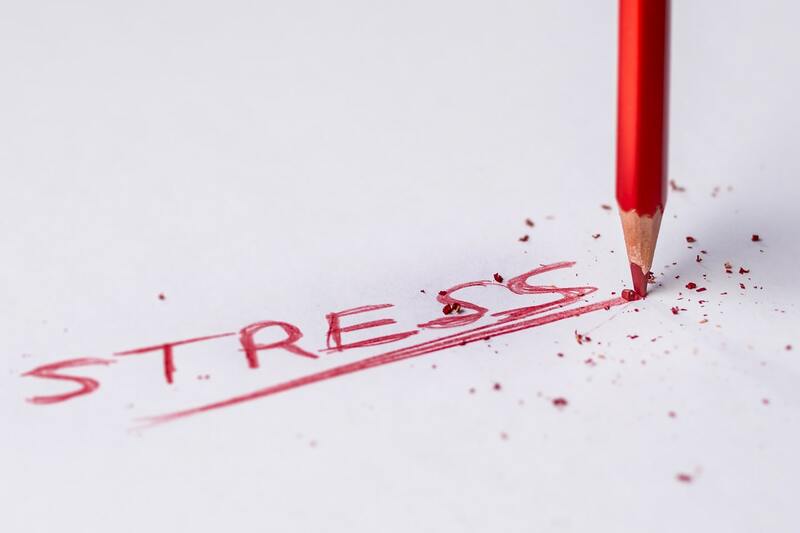 While you probably know that acute stress can help to give us a sometimes much-needed burst of extra energy and focus, we all know, at least anecdotally, that continuous (chronic) stress isn’t good for us. Before we talk about chronic stress though, let’s talk about tigers for a minute. Real quick. Thankfully we don’t happen to encounter tigers on a daily basis anymore though. And yet, we still get stressed. Because our stressors (i.e. the things that trigger our stress response mechanism) have changed. Nowadays we get stressed by having too much to do, by our children fighting, being late, or being stuck in traffic. Believe it or not, whether it’s a tiger or forgetting your child’s packed lunch, our body reacts exactly in the same way. And whilst tiger encounters might have been once-in-a-lifetime experiences for our ancestors (thank God for that!) today’s stressors are extremely common. You and I can probably list quite a few that affected us today alone. They’re probably very similar to yesterday’s, tomorrow’s, and the day after’s. And that, my friend, is continuous stress. The type of stress that affects our brains. The first video I watched was “How stress affects your brain”, by Madhumita Murgia on TED-Ed. In this very interesting video I learnt that when our bodies detect stress, a message is immediately sent to our kidneys to produce a bunch of hormones, of which the most (in)famous one is cortisol. This cocktail of hormones primes your body for instant action. Great when you’re fleeing from that tiger, no doubt. But high levels of cortisol over long periods of time increase the activity level and number of neuro-connections in the amygdala, our brain fear’s centre. This makes us more prone to worry, fear, and anxiety. At the same time, the electric signals in our hippocampus – the part of our brain associated with learning, memory and stress control – deteriorate. Hence why when we’re stressed we find it harder to concentrate, we forget things, and we even find it harder to calm down and recover from all that stress in the first place. Studies have also shown that too much cortisol in our bodies results in the loss of synaptic connections between neurons and in the shrinking of our pre-frontal cortex, which is the part of our brains that controls decision-making, social interactions, concentration and judgement. Too much cortisol also leads to less new cells being created in the hippocampus. At the risk of oversimplifying matters, too much cortisol in our bodies from a constantly-triggered stress response causes our brains to shrink! Scary! Here’s quite a similar video to the previous one – “How stress can affect your body“. We already talked about cortisol. But the stress response process produces other hormones as well. These include epinephrine (or adrenaline) and norepinephrine. As these travel through our blood vessels, they cause our heart to beat faster and increase our blood pressure. When this happens too frequently, it isn’t great for our bodies. Too much cortisol in our bodies is also responsible for altering the way the inner lining of the blood vessels works, which can cause cholesterol plaque build-up. Stress also heavily affects our digestive system. There’s a proven, strong connection between our brains and our enteric (or intestinal) nervous system. And too much cortisol can disturb the contractions that move food through our gut, potentially leading to IBS symptoms and increasing our sensitivity to acid (and heartburn). Plus, if that wasn’t enough, stress can also change the composition and function of our gut bacteria, which affect our digestive and overall health. And these are just some of the ill effects that too much, continuous stress can cause to our bodies. But is stress all negative? Not quite. One of the best videos I’ve come across so far is this fantastic talk by Health Psychologist Kelly McGonigal, called “How to make stress your friend“. McGonigal is also the author of The Upside of Stress – Why Stress is good for you (and how to get good at it), and in this fantastic video she challenges us to change our mind about stress. Can we change our body’s response to stress by changing our mind about it? Can we all ‘get better’ at stress? She quotes studies that prove that the way we think about stress matters. If we start to view stress as something that’s helping our bodies raise to a challenge, our bodies believe it. In fact, whilst we know that chronic stress can cause our blood vessels to constrict, McGonigal shows that if we choose to view stress as a positive, our blood vessels don’t constrict as much. They’re more open, reflecting a different state: courage. Plus, and this was quite a stunning discovery for me, ‘stress makes us social’. A by-product of our stress response mechanism is the release of oxytocin in our bodies. Oxytocin is also dubbed as the ‘love hormone’ – it’s great for bonding during pregnancy, breastfeeding and those early parenting days, for example. But it also fine-tunes our brain’s social instincts and makes us crave physical contact, enhances our empathy, and makes us more willing to help others. In other words, oxytocin makes us reach out to others asking for support at times of stress. Isn’t that totally totally amazing? Plus, oxytocin effectively protects our bodies from some of the ill effects of stress, in particular, the ones impacting the cardiovascular system. Oxytocin is also a natural anti-inflammatory and helps the vessels stay relaxed. This to me shows that the more you do seek social interaction and support, the more oxytocin you can flood your system with. The more you reach out to others when you do feel stressed, the better you can recover from it. And reduce its most negative side-effects too. Another video that supports this theory that how you think and act can transform your experience of stress, is the TEDx talk by Alex Charfen, “Acknowledging the power of positive stress”. You totally have to watch this one – Charfen is quite a presenter. In his talk, where he shares his story of profound stress triggered by bankruptcy back in 2008, he shows how without any stress, we’re actually not really productive at all. In fact, some stress at work, for example, keeps us stimulated. Without it, we feel bored, underutilised and under-involved. Too much stress, of course, makes us distressed and can lead to exhaustion, ill health, and even breakdown. But if we can switch our perception of stress, we can change everything. We can get to an in-between state called ‘eustress’. It’s an area where, when it comes to performance and productivity, we are at our best. In this state, we can choose to see stress a positive – a force that moves us forward and allows us to grow exponentially. And last but not least, is this talk by Brian Luke Seaward, called “Stress management and human spirituality“. Seaward is an expert in stress management, mind-body-spirit healing, and health promotion. In this video, he talks about the power of the four areas that ‘make us whole’ – mind, body, spirit, and emotion. Out of these, we tend to focus on the body a lot. It’s easier, it’s ‘out there’, and it’s more measurable. But if we don’t honour the integration, balance, and harmonies of these four areas, we’re going to end up with dysfunction. And this matters, because while we try and look at stress-management techniques that work on the body or the mind or on emotional control (more on this later), we often overlook the spiritual side of things. How we deal with stress is also with our spirits. Whether you call these inner resources or coping techniques, when it comes to the ‘spiritual cure’ for stress, think about faith, humour, optimism, patience, compassion, forgiveness, and love. Seaward calls these the ‘muscles of the soul’. And we should exercise them as much as we exercise the muscles of our body and mind. But like I said, watch this space for more on stress management techniques that do cover all these four areas. So, will you be watching any of these videos? If you did, which one was your favourite? 11 ways to stop feeling overwhelmed when you have too much to do. For weekly advice on how to overcome stress and overwhelm, simplify your busy every-day life, and improve your well-being, sign up for my newsletter. It’s out every Monday and packed with practical tips and inspiration, exclusive to my readers! Plus, when you sign up, you’ll receive my FREE 30-day self-care challenge! Next Post Mental health: could you be struggling but be unaware of it? Great ideas! I am really keen on watching TED. I can learn many precious lessons from this. Lie on a soft mattress and lean on some foam pillows and watch TED are what I usually do to reduce stress or tension after hard working hours. You’re welcome Lisa – hope you get to watch and enjoy! Ah that’s amazing – they are fantastic! I think I need to relearn how to make stress work for me. When I was younger and a member of the working world, I used to thrive off stress and outperform my peers. Nowadays, stress just gets me down and wipes me out. I know I can make it positive again! That’s such a great example of what they say in the videos, right? Good luck with doing that – it must be hard! I know I find it super-hard! Oooh I think I’m full of cortisol right now. You’ve described me well. I try to go with the Ignore it and push it deep down and it will go away method. Not so sure it works. Think it just goes on simmer. Oh that sounds dangerous 😉 In all seriousness though, it has funny ways of coming out in a bad way when we least expect it, if we ignore it. Hope the pressure eases a little for you!